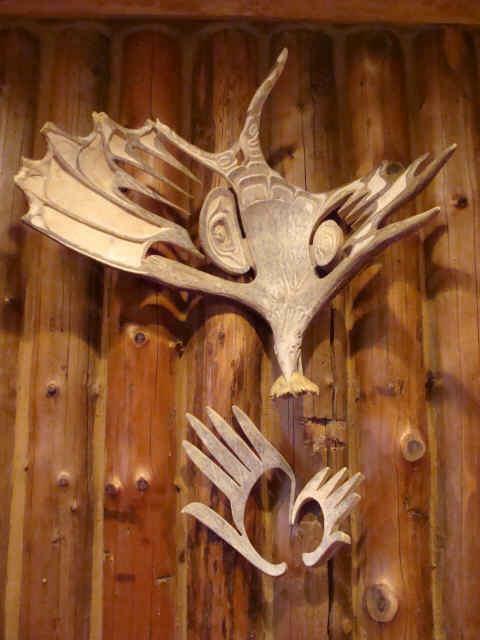 "RAVEN BRINGS LIGHT TO MEN"
"Raven Gives Light to Men"
In this moose horn carving......the Raven is depicted as "good" in returning "stolen light"to mankind....stolen by an evil unknown force. Gareth hunts for sheds such as this one to tell a story in his unusual and dramatic creativity. The Raven is carrying the sun in his beak. The sun is the button of the antler shed....and is quite an unusual piece. Gareth has carved the "hands of man" from the inside section of the moose horn shed to "reach up" and receive the "light" from the Raven. Each of Gareth Andrews' carvings is unique as no two antlers can depict a story in the same way. He hunts for antler sheds in Northern Minnesota. Gareth Andrews is available for commissioned pieces.